Using the Microsoft Band 2 has been a pretty remarkable experience for me. I have been using running gadgets for almost as long as I've been running at all, and they've come a long way. In the Microsoft Band 2, I feel like technology has finally reached the point it needed to be. I can imagine that the technology will continue to improve, but as a consumer, I am not wanting for anything. Finally, I'm "there." No lie: I was sooooo jealous when my friend got one of these. Actually, this one is a more advanced version of the first one I had. 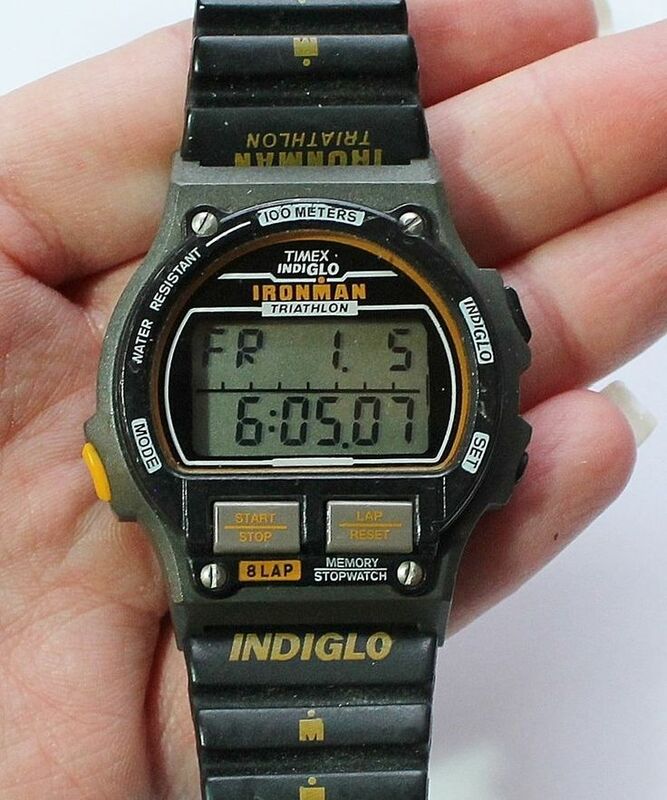 The one pictured here possesses what was, at the time, the great quantum leap in watch technology: "Indiglo" technology, which made the watch face easy to see in the dark. Ironman Triathlon watches were essential because they had full stopwatch functionality - including the critical "lap" function - and could store all 8 laps of your high school 3200m race. With this innovation, you could perform more in-depth race analysis. I remember working with my dad to come up with the right strategy for running a 1600m in 4:25. I had to run my first and last laps in 64 seconds, and I couldn't run any lap slower than 67. It took a few tries, but I nailed it. And I was tracking my lap times carefully at every practice and every race. Later, Timex introduced an upgraded version of the watch that included a feature I absolutely loved: It was a variable intervalic timer. You could set the timer to count down, say for 2 minutes, and then count down for 4 minutes, and then repeat. 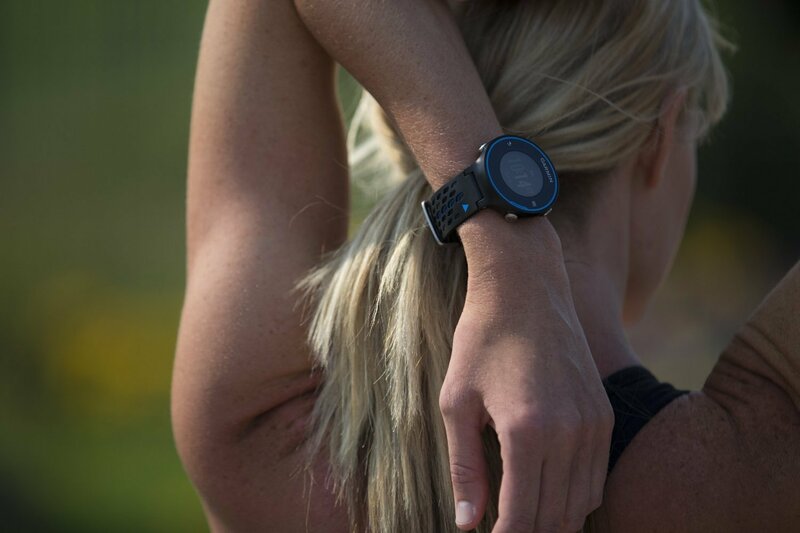 In this way, you could use the watch to help guide you through fartlek workouts or other kinds of complex intervals. It was very useful, but its options were limited. You couldn't, for example, program 4 totally different intervals, and then ask the full set of 4 intervals to repeat. I maxed-out its capabilities, but was still left wanting. Then came the era of the GPS running watch. At first, they felt like belting a deck of cards to your wrist, but it was oh, so worth it! With the ability to track both position and time simultaneously, these new watches could provide you with your current pace, in real time, at any point in the run. All those calculations my father and I did to work out the perfect lap-by-lap 1600m strategy would have been unnecessary if we had had a GPS watch at the time. The watch could have told me, whenever I wanted to know it, whether or not I was on pace. It's like a Palm Pilot on the back of your hand! Nevertheless, it was disappointing having to think your way through a complicated interval workout with only a chronograph. So it wasn't surprising to find that the next-gen models had presented a patchwork solution. You could either download interval workouts from the website, or use the browser interface to create your own, and then upload them to your watch. The problem with option #1 was that this often involved downloading a whole race-specific training program, rather than one simple workout. The problem with option #2 was that the interface was so odd and confusing that I never actually succeeded in uploading one of my workouts to my watch. And I'm tech savvy about these things! But, the addition of heart rate monitor connectivity was a good one. Suddenly I had the option of training with HR zones. Even more interesting was the fact that I could gain insight into my estimated VO-2 max, a sort of proxy for cardiovascular fitness. Heart rate monitor chest straps aren't very comfortable, and they are extremely dorky-looking, but the data was good and the compromise minimal. I expected at the time that this was the best it was going to get. Anything else, such as full-color screens, would be pure fluff. When FitBit and similar companies released fitness trackers with built-in heart rate monitors, I was envious. How great would it be to have a running watch with an HR monitor built into the band? But when I saw that Microsoft's Band 2 had the HR monitor and a GPS tracker I was totally sold. This was all the technology I was getting in a running watch, plus all the technology my wife was getting in her fitness tracker, all rolled into one. It could track my sleeping patterns and tell me the weather and all that nifty stuff. And I could use it to pay at Starbucks. But what really seems to set the Band 2 apart from the competition is the "Guided Workout" functionality. This is the interval solution I've been longing-for across all these years. In theory, this should be dead-simple functionality. We're talking about a customizeable timer combined with constomizeable on-screen text. If something that can measure the amount of ultraviolet radiation coming from the sun can't give you something that a Nokia phone could give you 20 years ago, that would be a problem. Microsoft didn't just ham-fist a solution together like Garmin did. They made it easy. You just type in your text message, type in the amount of time you want, repeat as desired, and there you go. There's no need to plug your watch into your home computer, there's no uploading, downloading, upload failure, error-please-fill-out-all-required-fields, none of that. Just type and finish typing and you're done. Simple. Finally - finally - I have everything I want. I can track distance, time, and pace in real-time. I can track heart rate in real time, and do it without having to wear a chest strap, and with seemingly no difference in the quality of the reading. I can interact with fellow runners socially. I can do complicated interval workouts. I can program my own. This watch, this tool, could have made me a better runner if I had had it in my formative years. I envy each and every high schooler learning to race in this day and age. With technology like this, they have data insights that can save them a lot of effort. For the rest of us, these gadgets have gone from being a novelty to being truly useful and fun. It's been a great journey, and I think we've finally "arrived." New developments are sure to happen in the future, but as I said at the outset, I am no longer missing any piece of the puzzle. The Microsoft Band 2 can do it all, at least for me.